Dubai, U.A.E., 12 October 2017: Emirates Group Security held its annual graduation ceremony to award aviation security and ground handling diplomas to the graduating class of 2017. 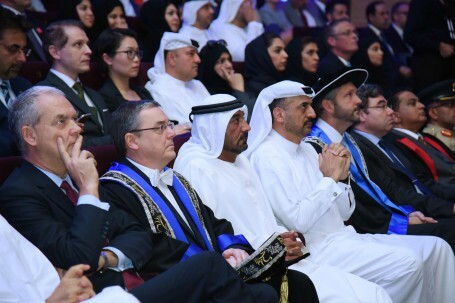 The ceremony was held in the presence of His Highness Sheikh Ahmed Bin Saeed Al Maktoum, Chairman and Chief Executive Emirates airline and Group and Mr Steve Chapman, Vice Chancellor of Edith Cowan University, Australia along with other senior dignitaries from the Emirates Group and friends and families of the graduates in attendance. A total of 112 graduates from over 25 nationalities graduated from Emirates Group Security's Centre of Aviation and Security Studies (CASS). 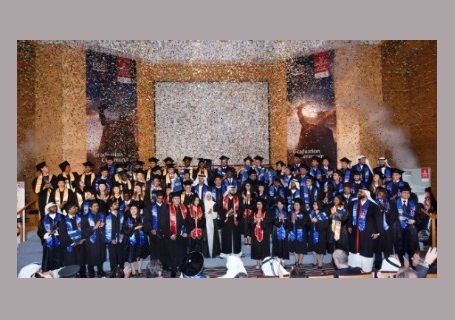 The graduating class included staff from the Emirates Group as well as external candidates. 72 students received diplomas in aviation security and 40 students received diplomas in ground handling. CASS, the learning and development arm of Emirates Group Security was set up in partnership with Edith Cowan University (ECU), Perth, Australia. The diplomas received by the students are awarded under Australian commonwealth university guidelines and are also recognised by the U.A.E. General Civil Aviation Authority (GCAA). Students also have the option to earn internationally recognised credit points for future courses of study with Edith Cowan University. Currently, over 1600 students have graduated from CASS since the start of the aviation security course in 2003. "Through CASS and our partnership with Edith Cowan University, Emirates Group Security offers students a range of educational programmes in aviation equipping students with the specialist skills required to manage security needs in today’s aviation industry," said Dr Abdulla Al Hashimi, Divisional Senior Vice President, Emirates Group Security. "ECU is proud of its partnership with Emirates through Centre for Aviation and Security Studies (CASS) and it serving as a model for strategic partnerships between a university and business, where academic rigour underpins and strengthens practical application," said Steve Chapman, Vice Chancellor, Edith Cowan University. "ECU and CASS will continue to strive tirelessly to nurture the skills of our students, strengthen education and training initiatives, and play our part in building the future of the U.A.E.," he added. The diploma programmes for aviation security and ground handling last 18 months. Students are taken through a range of subjects including aviation security, threat assessment and management and aviation logistics. In addition to the diploma programmes, Emirates Group Security offers a number of short term university-level accredited training programmes in aviation and general security for ground staff, aircrew and professionals from security and related industries.